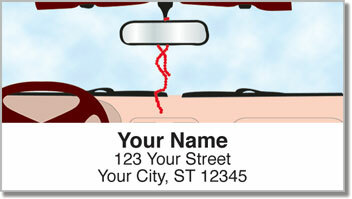 We don't know for sure who first came up with the idea of hanging stuff from a car's rearview mirror. But those familiar fuzzy dice were the first items actually sold for that purpose. Fuzzy dice came on the scene in the U.S. during the 1950s. It's believed to be part of a tradition started by World War II pilots who kept dice in their cockpits to bring them good luck. 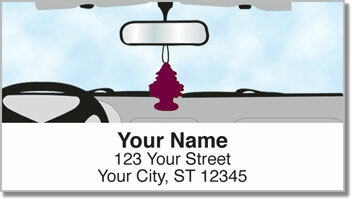 Since the fifties, we've added air fresheners, dream catchers, Mardi Gras beads and more! 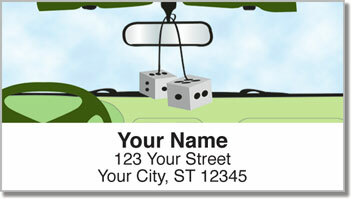 Car Mirror Dècor Address Labels are a fun way to mark every piece of mail. Plus, you'll save a ton of time because you'll no longer have to fill out envelopes completely by hand! 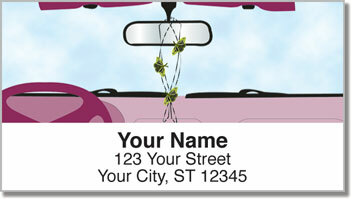 Get your own Car Mirror Dècor Address Labels now! They also come in matching personal checks.